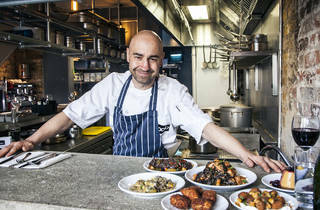 A small-plates Italian from a chef who trained under Theo Randall. Listen up, peeps. 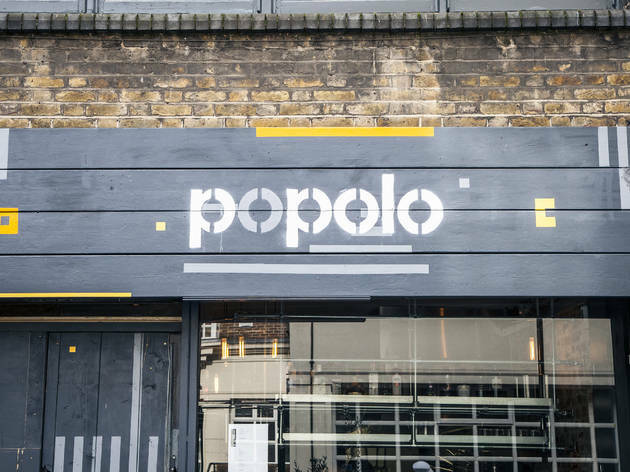 Popolo is one of the most brilliant Italian restaurants to open in London in ages. 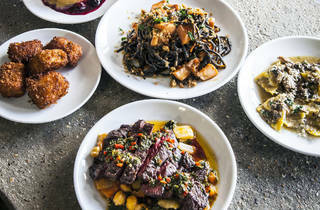 The kitchen has the small-plates creativity of Bocca di Lupo, the commitment to ingredient quality of the River Café and the borrow-from-the-Med-and-Middle East approach of Morito. 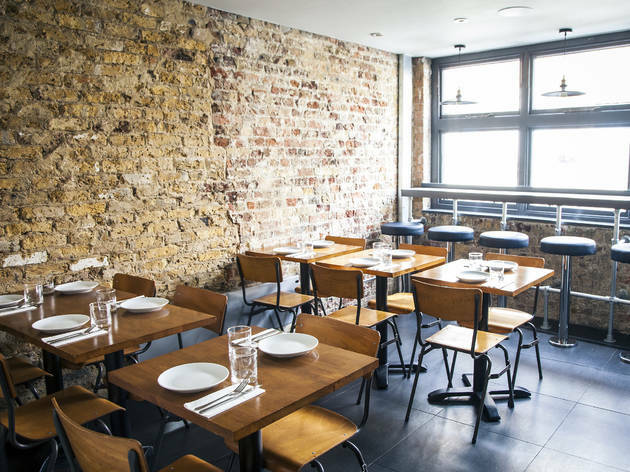 All this on a Lilliputian site – just 16 seats at the counter, four at the window, the rest at tables upstairs – where the Saturday night soundtrack was gangster rap (low-level, radio edit variety: you can still bring your mum). The floors are concrete and the narrow counter a kind of rough grey stone that made me want to pumice my face with it. Anyway, the food. It’s stunning. Dishes are, paradoxically, both plain and complex at the same time: on a snack plate of just labneh, olives and chickpeas, the seasoning was a house-made dukkah and the olives had been deep-fried. Specifically, ‘pane’ breaded (that is, dusted in flour, rolled in egg and a coating of fine breadcrumbs) and then deep-fried. You bite into the crunchy shell and lo – there’s a jewel of shiny, purplish kalamata inside. It’s a premium olive, gutsy and briny. The warm, crunch-coated foil to a cool, creamy canvas. And that’s just a snack. 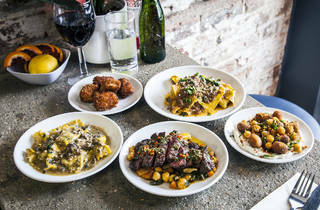 Pasta – in dainty, tapas-sized portions – was cooked to al dente perfection, the sauces invested with depth and intensity. There were wide folds of pappardelle layered with homely hare ragu and pinched little parcels (agnolloti) filled with slow-braised, achingly tender shoulder of veal. 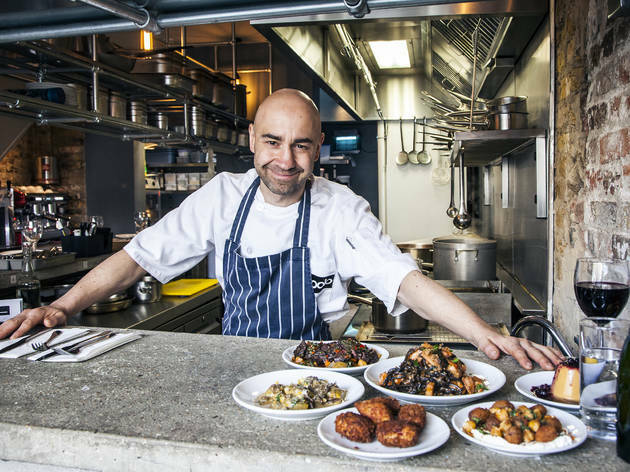 The technical prowess here betrays the classical training of head chef and co-owner Jon Lawson (an ex-kickboxer, he came to cooking late in life, training under Theo Randall). Iberian influence comes from Lawson’s Spanish mama: if there are croquettes on the menu, snap ’em up. Each shell was tantalisingly crisp, its centre silken. Opening one up is a bit like cracking an egg. Even a simple grilled bavette – terrific value at £12 – was that little bit special. 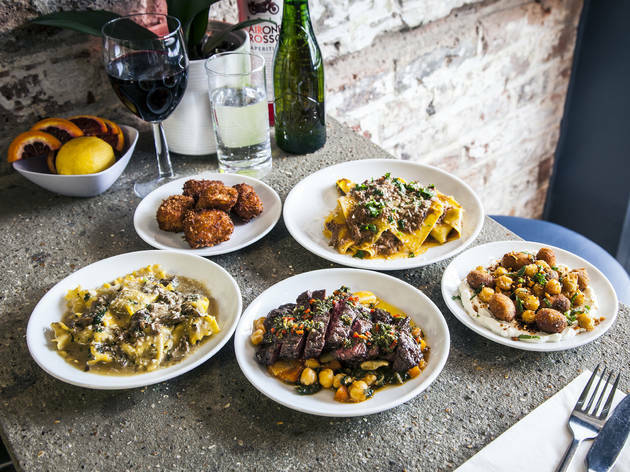 At Popolo, they marinade the meat for up to two days, so the juices are ‘drawn out, then all the way back in again’. The steak is then chargrilled and sliced, laying bare its shimmering ruby innards. Over the top was a fragrant, zingy chimichurri (parsley, oregano, garlic, chilli, red wine vinegar, olive oil). 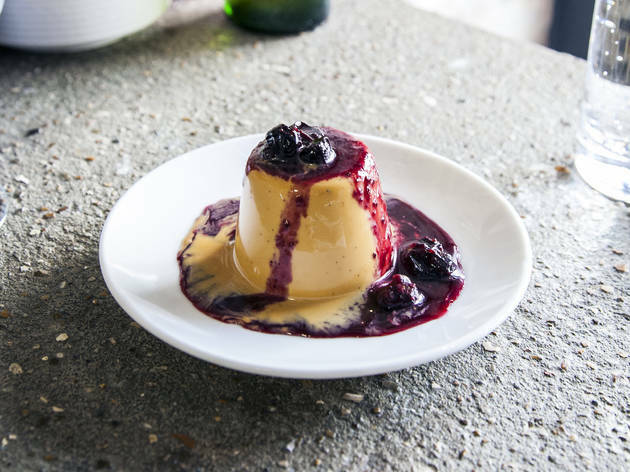 Underneath, a mattress of wilted cavolo nero and morsels of sweet, melt-in-the-mouth celeriac. So it pains me to note that service, though genial, tailed off as the night wore on. If you’re going to have counter chefs who focus on the cooking (perish the thought! ), then you need a server that’s, you know, ‘around’. I didn’t quite bang my fork, shouting ‘bring out dessert! It’s time for dessert!’ but I thought about it. Still, that’s a simple fix. What they can’t easily remedy is the lack of legroom at the counter: the unavoidable consequence of a restaurant this skinny. So if you’re with someone who pays for the emergency aisle on Easyjet, consider the tables upstairs. Just don’t let it put you off. Go to Popolo. Immediately. We came here as a group 8 for lunch, and was seated in the cosy dining area upstairs. The kitchen/bar area with an L-shaped counter seating fills most of the ground floor. The restaurant decor is simple but smart and has a relaxed atmosphere. We were informed by a friendly Italian waitress that the fare here is Italian small plates (think tapas), with Middle Eastern influences. For starters, we ordered the Padron Peppers (not bad) and the Burrata with Black Figs & Orange Blossom Honey which was so fresh and a perfect combination! The pasta (we had the Ravioli with Delica Squash + Ricotta, and Agnolotti with pork cheek) were richly flavoured but slightly more al dente than I preferred. The grilled octopus was another highlight and tasted like it was fresh off the boat. 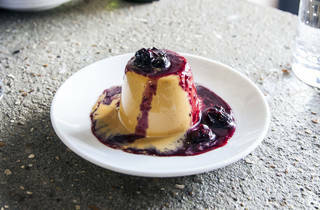 The Burnt Honey Pannacotta was a lovely dessert to finish the meal with. 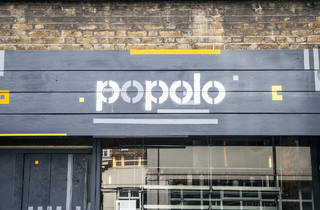 Overall, a great addition to the Shoreditch food scene and will definitely be back for more. 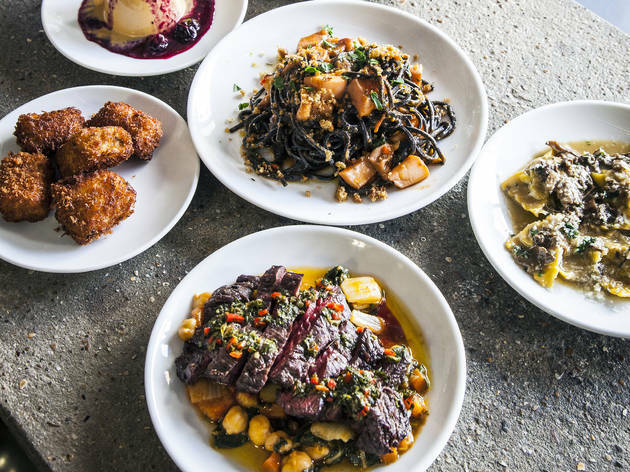 I live locally to Popolo and since they opened in September last year, every time I want to have a feast, Popolo is my first choice. Sophisticated plates with a home food flavour. I simply love it there. 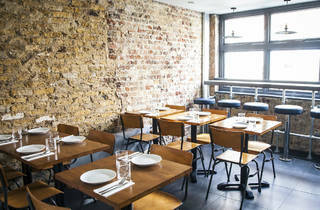 This really is a fantastic restaurant boasting a fabulous menu that's cooked and prepared right in front of you, assuming you're lucky enough to get a seat at the counter. The service was friendly and swift when we visited and the bill was a very reasonable £180 between the four of us. Definitely going again when back in London!! Fantastic meal here. The most delicious food and a fun, relaxed, unfussy atmosphere. The perfect Aperol Spritz too! Amazing restaurant - top quality food, especially the grouse cappelletti. Nice relaxed service as well. Highly recommended.